David Otey is a Personal Training Manager at Equinox Fitness in New York City where he is responsible for the growth and development of 60+ personal trainers. 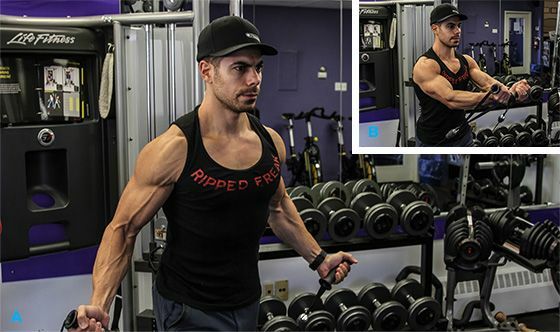 If you are looking to build a herculean torso, with broad shoulders, a thick chest, and dense arms, then incorporating presses into your program is a must. But too often poor technique and the wrong exercise selection lock you into a fixed movement pattern, which can damage your rotator cuff and shoulder joint. And while piling on the plates for heavy overhead and bench presses is great - being sidelined from training for weeks, or even months, is not. So, if you are looking to add some serious size without sacrificing your joints, upgrade your routine with these alternatives to classic pressing movements. The first step to restructuring your shoulder training in a way that promotes growth without injury is understanding how your joints work. While your muscles may dictate movement, your joints allow for movement, and pushing your joint past its capabilities will lead to injuries that only set you back in the gym. For the sake of this article, the GH and ST joints are the two we'll focus on, since they're the primary muscle movers. 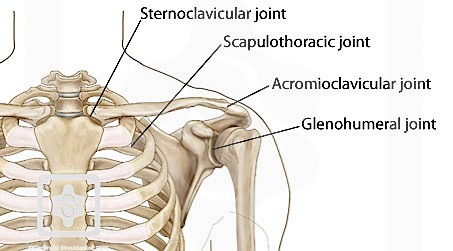 The glenohumeral joint - one of the more unstable joints in the body, which relies on muscles and ligaments to retain its structure - is where the head of your humerus, or upper arm, meets your scapula. When it comes to training, this means that any movement that involves pressing or rowing demands synergy between your upper arm and scapula (shoulder blades). This synergy is called scapulohumeral rhythm, and if you want to maximize your ability to press while minimizing injury, it's important to pay attention to it. Otherwise, you'll perform lifts that lock the scapula into place and put unneeded pressure on the GH joint, which, over time, can damage the rotator cuff. For example: When it comes to pulling exercises, the head of the humerus pokes forward once the elbow is behind the body. (Row your elbow past your torso and poke the front of your shoulder. You'll feel the bone.). Ultimately, that'll eventually create elasticity in an already unstable joint. Most times, these injuries are avoidable simply by focusing on your form - the shoulder joint is most stable with the elbow by your side - and leaving your ego at the door. Each body is different, however, so here are a few key points to keep in mind while training when it comes to maintaining shoulder health. - Be cautious of exercises that lock you into place, like barbells and machines. - Allow for proper scapulohumeral rhythm for healthy movement. - The closer your elbow is to your body, the more stable the shoulder is. - Avoid exercises that have your elbows move past your body, like improper dips and rows. Below, we outline five exercises that won't disrupt your scapulohumeral rhythm and list the exercises that they should be subbed in for. Why? A traditional bench press places an immense amount of pressure on the shoulder, especially when the weight gets too heavy and the lifter's elbows flare out. Pressing with a neutral grip (palms facing each other) keeps the elbows close to the body, which puts the shoulder joint in a more stable position. As a bonus, the neutral grip is also more comfortable on the wrist. Why? Pressing with a barbell locks your arms into place, which doesn't allow your body to make small mechanical adjustments during the lift as you can do with dumbbells. Sub for: Incline Bench Press. Why? The unique angle of the incline bench press, which is halfway between a shoulder press and bench press, pushes your arm back and your shoulder joint forward. And pressing heavy weights - which lifters love to do on this exercise - from this weird angle will give way to an injury. The landmine incline press allows your elbows to adjust to a more stable position. Sub for: Low Cable Flye. Why? Low cable flyes place unnecessary strain on your shoulders, which takes tension off your chest. Instead, try the underhand cable chest press. Pressing at an upward angle will still target your upper chest and will keep your elbows in a more stable position, at your sides. Why? Dips are an effective triceps builder, but most people lean too far forward. This places your shoulder joint in an unsafe position and risks a rotator cuff injury. Parallette bar pushups allow you to target the same muscles without cranking back your elbows at the expense of your shoulder. The Best Damn Shoulder Saver. Period. Based on the title, you may be expecting some elaborate warmup of band pull-aparts and rotator cuff exercises, but that's not the case. While those exercises are good for warming up your joint, it won't strengthen it, and a strong joint is a safer one, which is why we recommend loaded carries to promote shoulder health. The primary responsibility of the rotator cuff is to keep the head of the upper arm in the joint socket. When you walk with heavy weight, your rotator cuff is called upon to maintain stability, and reinforcing this reaction will create a more prepared joint over time. Oh, and your rear delts will get huge, too. Work loaded carries into the end of your program, which will double as conditioning (trust us). Walk for 25 yards with 40-50% of your bodyweight in each hand. Repeat four times. And remember to walk slowly and with controlled steps. Don't let the weight touch the side of your legs, as this takes tension off the shoulders. 1) Neutral-Grip Dumbbell Press, 4 x 10. 2) Incline Landmine Press, 3 x 10. 3) Dumbbell Shoulder Press, 3 x 10. 5) Pushup on Parallette Bars, 3 x 15-20. 6) Loaded Carry (farmer's walk), 4 x 25 yards.